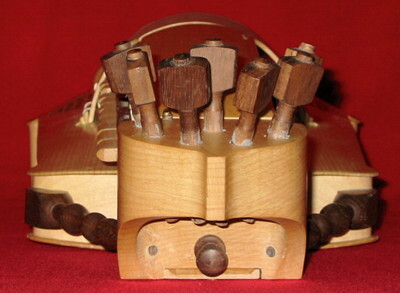 This hurdy-gurdy is based on a late 16th or early 17th century example in the instrument collection of the Royal College of Music, London. My working plans are derived from an exhaustive set of measurements I took a few years ago. 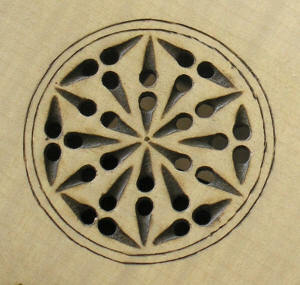 Hurdy-gurdies of this type were common throughout most of the 16th century and the first half of the 17th. They were also revived at the French courts in the 18th century as "rustic" instruments. A similar instrument in the Victoria and Albert Museum was overhauled in about 1750, with the addition of much ivory and ebony. 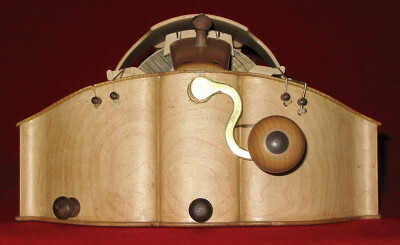 The Royal College model has two chanterelles, mouche, trompette, tenor and bass bourdons, and, unusually, a fifth drone running through the pegbox, between the chanterelles. This can be set up in a number of ways - e.g. as a unison with the mouche or trompette, as a high drone, or tuned to an alternative note to facilitate quick key chages. There is a built-in storage compartment between the head and the front block, accessed from the underside. This is very useful for storing the tuning peg, cotton, spare strings, and any other small accessories. The tone is satisfying and rounded, not too loud, but it is incisive enough to play for dancing, and blends excellently with a renaissance guitar.